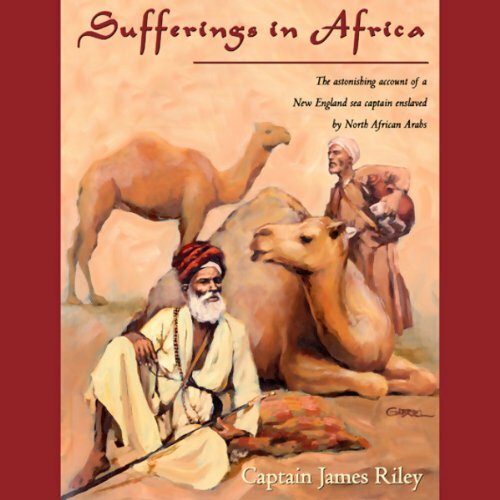 This dramatic account of Captain Riley's trials and sufferings sold more that one million copies in his day and was even read by a young and impressionable Abraham Lincoln. The degradations of a slave existence and the courage to survive under the most harrowing conditions have rarely been recorded with such painful honesty. Sufferings in Africa is a classic travel-adventure narrative and a fascinating testament of white Americans enslaved abroad, during a time when slavery flourished throughout the United States. This is a harrowing and amazing account by a New England ship captain of his crew's shipwreck off northern Africa in the early 1800s. His writing is vivid and comprehensive, describing their treatment, and the lifestyle of their captors, and how his own wits and faith saved most of his crew. It is quite grueling, but worthwhile and it all ends well, thankfully. I kept wondering how many Americans had died overseas in similar circumstances, those who had not been able to talk their way to freedom? The narration is good, as well. I tried two or three times to listen to this book, partly because I saw the story on TV and it was utterly captivating. However, the narrator has such a strange oral delivery that I found it impossible to concentrate sufficiently and get into the story. He has a nice sonorous voice, but he doesn't seem to put the proper tones and intonations at the right places in the sentence. It is hard to explain, but you might want to listen to the preview first before buying. This is an incredible story! The author was capable enough to be able to tell us all that happened to him in such a way that after you finish,you feel (for better or worse) that it was actually you that had the experiences. I was captivated all the way through the book. This is a interesting and factual recount of witnessed history. A book now 200 years old that gives us an account of a culture that is long past and The roots of a culture the west currently grapples with. It is a must read for anybody interested in today's east west conflicts and honest real history. If you could sum up Sufferings in Africa in three words, what would they be? Great story, I couldn't believe I had never heard of this story before. Very vivid descriptions of the Arab culture as well. I recommend this book.